Discover 8 upgraded benefits with the power of Bond Ultim8. 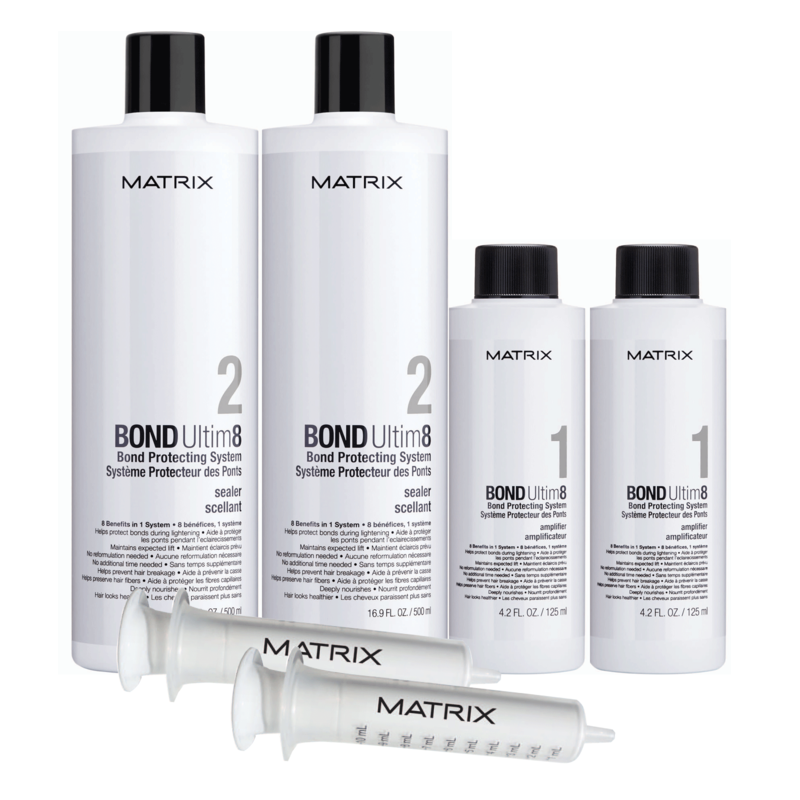 Protect bonds and keep hair strong all in the same service. Weekly Sealing Treatment perfects fibers and provides additional nourishment at home, following the in-salon service. "I decided to give this a try being that Cosmo won’t carry the bond creator and protector we do not speak of ;) However, having taken myself from 4N to white platinum and then to silver grey in just two short days. I know my bonding treatments. Sadly when you compare the results on clients and yourself, you will notice that this product is nothing more than a chemical coat and sealer . Breakage will occur - do not assume you can do with Bond8 what you can do with Olaplex. Personally having tried them all. For coloring, high lift on moderatly damaged hair , toning and depositing - I use Amika Virgin. It’s not like Olaplex where it’ll glue broken bonds back together. But it will stop it from happening and it uses real nourishing ingridients to make the Hair soft and healthy - sealing the cuticle for a great result. Stay away from Redken and Matrix plex formulations. Stick with Olaplex and Fibreplex if you decide to try something new and available at Cosmo - Amika Virgin. Fibreplex - or the new BlondMe lightening line is the number 1 choice for bleaching and all the services that come with it . Combine a small amount of Olaplex with Schwartzkopft BlondeMe built-in bonding system line. Or Combine Olaplex with the Fibreplex using the full mixing ratio for Fibreplex and half the ratio for Olaplex . You will be able to do WHATEVER you want and never compromise the hairs integirty. The reps say not to mix - but trust me , it hands down allows you the reputation as the go-to Hair saver , Hair fixer and bleach blonde guru extraordinaire." "I must admit after reading the reviews with olaplex and them having the patents I had low expectations using this product. this product is amazing, my hair has stopped breaking and I just did a follow up call on a heavily highlighted client with fine hair no yellow;) and a month after her service using her step 3 weekly she reports no damage!"